A pop-up restauurant for dogs is opening in E2 for two days - Saturday 11th & Sunday 12th April 2015. Called the Curious Canine Kitchen, it will serve dogs and their human friends at two sittings per day - 1pm and 3pm - with the canines getting a special 5 course menu for £20, served by waiters. Note that this event is BYOD - Bring Your Own Dog. Note that the event is 100% in aid of the charity Amazon CARES - animal rescue in Peru. 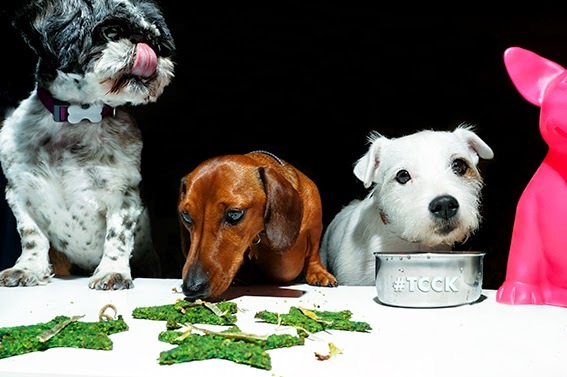 "A holistic restaurant for four-legged friends, The Curious Canine Kitchen will pop up on Saturday 11 & Sunday 12 April in London‟s Shoreditch. Featuring two seatings each day (1 - 3pm & 3-5pm) this doggie fine diner is the first of its kind in Britain to serve high-end, freshly prepared, organic canine cuisine. A ticketed event, (tickets are priced at £20 per dog & owner available via www.CuriousCanineKitchen.com) Lucky Foodie Fido‟s will be treated to a five-course, drink paired set menu. Items on the “The Nature Way Tasting Menu” for dogs include Textures of Tripe with seaweed and kale puree, crispy Paddywack with reishi mushroom flaxseed cream and coconut and blueberry chia pudding with gluten-free cinnamon quinoa „dog biscuits‟ to name a few. Served alongside refreshments such as Alkaline water, beef consommé and coconut water, the menu will be polished off with a piquant marrowbone (indeed artisan bones no less from Hill &Szrok), known for its teeth cleaning properties and a 'Fresh Breath' herbal tea tonic to aid digestion. Served by waiters at one of the restaurants four bespoke doggy tables, any left over‟s will be available to take home in a doggy bag, along with a special goody bag featuring some easy tips and tricks on introducing fresh foods and herbs to a dogs diet as well as recipes and samples from dog loving sponsors including brands such as Diet D‟Og and Woof&Brew. On-site entertainment includes a fido photo booth for posing pooches."